We serve a big, tasty breakfast buffet with lots of organic and healthy options. There are three large car parks connected to our hotel; one covered car park and two outdoor car parks. Our guests park for free when they stay with us. We also have marked disabled spaces, and parking and charging spaces for electric cars. Come and work out in our stylish, modern gym. We have exercise machines, free weights and other equipment so you can exercise however you want. 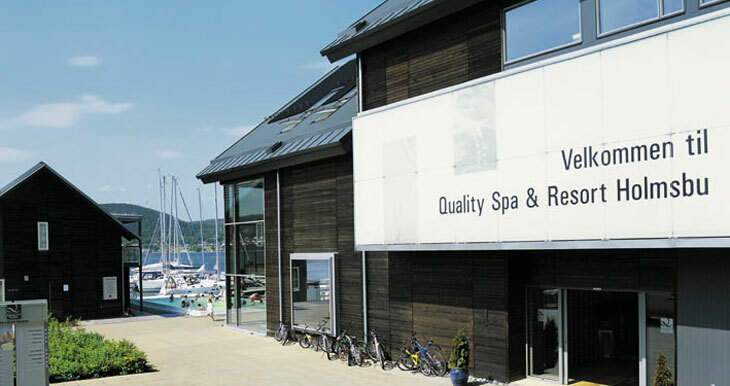 Pets are welcome in some of the rooms at Holmsbu Hotel & Spa for a fee of NOK 250 per visit. Please remember to tell us when you make your booking, so we can do our best to meet your needs. Our hotel has its own guest marina for guests who come by boat. Contact the hotel before arriving to agree an arrival time and price. All our rooms have free WiFi so you can connect your computer or tablet. Nordic Choice Club members can log in with their Nordic Choice Club number. You can also collect a login code from reception.